I was on my way home from work when I got the notification. Waiting for the walk signal to change I glanced at my phone and saw it was from the Vancouver Titans twitter. They were having a watch party for the Overwatch League Stage One final that Sunday. My first thought was that this was a bold move. It was only Wednesday after all. None of the playoff matches had been played. The Titans looked good, they were undefeated in stage one, but there were seven other talented teams in the playoff race. Anything could happen that week, and in fact other final team wouldn’t announce their party until their presence was a sure thing. My second thought was more relevant though. Could I make it? I had been to Vancouver before. Living in Seattle it’s less than three hours away if there isn’t any traffic. I had been fortunate enough to go to the launch party for the team back in December so I knew the venue as well. The Sportsbar LIVE! At Rogers Arena had put on a good show when the Titans were revealed to the world and they would be the setting for the Sunday match watch party as well. But the drive would be a six-hour round trip. Six hours behind the wheel and I would still be watching a stream. I thought about it for a full ten seconds, then I hit the Eventbrite link. I had the rest of the week to wonder if I’d been too hasty in my decision. The ticket was free, but I felt obligated once I’d signed up for it. Already keeping a close eye on the Titans this season I watched them for any sign that they wouldn’t advance to the finals. Of course now everyone knows how it went down. NYXL fell early, Vancouver styled on Seoul, and San Francisco looked like the team we all knew they were building towards. Saturday morning I was having the oil in my car changed in preparation for the trip when the Titans secured their spot. They were going to the final and I was going to Canada to watch them. The drive North was mercifully smooth. Even the border crossing went well. The border official seemed surprised that I would be coming to Canada just for a watch party, but accepted my reasoning for entry when I showed her the ticket. Pulling into Vancouver I was made aware again of the situation I was putting myself in. I was traveling internationally just to go to a watch party. At place where I didn’t know anyone and with work early the next morning. I shouldn’t have worried. For those unfamiliar the The Sportsbar LIVE! At Rogers Arena is fantastic venue attached to the famous Rogers Arena, home of the Vancouver Canucks hockey team. A great place to watch not just hockey, but any sporting event can be enjoyed at this superb location. The bar doesn’t lack for space and the entire upstairs area was devoted to the Titans that afternoon. A long bar with a massive screen, several tables filled with cheering fans, and comfortable booths were all present and made for the best way to watch a great game. Every screen I could see was devoted to the Overwatch League stream of the day. From each angle one could see the action and I had no problem seeing the match wherever I went in the venue. The Sportsbar LIVE! At Rogers Arena went the extra mile for the stream too. Early on it became apparent that no one was logged into the twitch stream and we’d have to suffer through the awful ads. No sooner had I mentioned this to my new friends at the bar, however then the main view changed to show the desktop and some saint had logged twitch into the stream, granting us all the benefit of their All-Access pass. Now whether this was an employee or a fan who made the save this move demonstrated that The Sportsbar LIVE! At Rogers Arena hadn’t simply put the stream on and forgotten about the fans there. They were paying attention and making adjustments as the game went on. This was further evidenced by their attention to the stream throughout the match. Muting the volume when the few commercials did come up and replacing the silence with appropriate music. A little thing, but I appreciated that they were taking the event seriously. Esports always struggles for legitimacy, but Sunday they were given the same attention, care, and respect as a Canucks game. The announcement when I got my tickets mentioned food and drink specials and The Sportsbar LIVE! At Rogers Arena delivered on this. Celebrating the Korean origins of the squad there were special Korean dishes available. The Titans used to be RunAway after all. Again, it was a little thing but it showed that they were taking the event seriously. And yes, there were also more beers on tap than Bud light. Esports has, historically, had a rougher relationship with physical merchandise than traditional sports. I’m happy to report that this wasn’t the case at The Sportsbar LIVE! At Rogers Arena on Sunday. In fact, let’s not mince words. The Titans gear available at the modest table Sunday was better than what is offered on the official site. Shirts, jerseys, small items, and (thank goodness) an actual baseball cap. I grabbed a Titans cap for myself and I’m happy that now I can add it to my shelf. It’s sitting there right now next to my Grand Finals hat and just like that one it commemorates a great and historic esports event. The place was filled with Overwatch League fans. 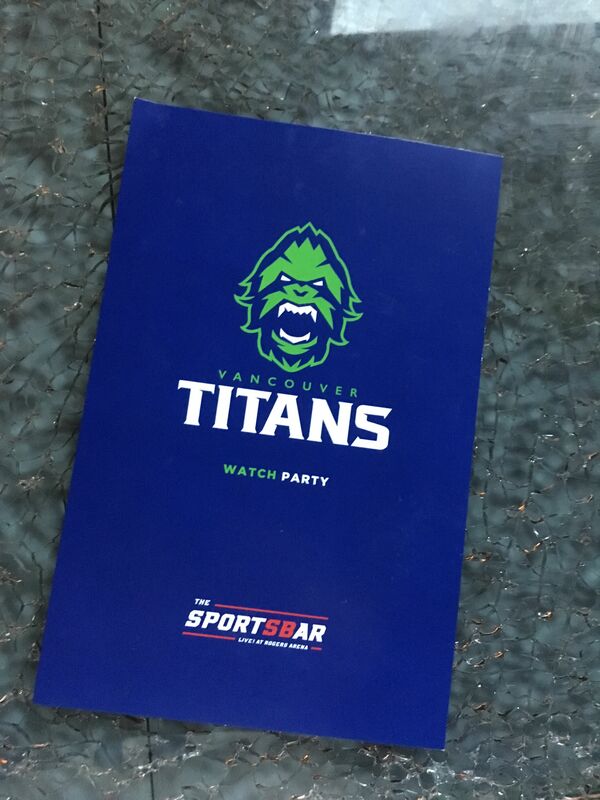 A sea of dark blues and bright greens had settled over all of the available space and each table had Vancouver Titans fans glued to the screens. I was a bit nervous coming in since I didn’t know anyone but I shouldn’t have worried. I was able to make friends quickly and we all had a great time discussing the plays, players, and our hopes for the next stage. Some like myself had even come up from the United States for the party. The match went the distance with all seven possible maps played. The momentum shifted back and forth between the Titans and the Shock the entire game and the crowed cheered, laughed, and boo’d as the home team gave it their all. The energy there was fantastic as all the fans watched every kill, every shatter, every ultimate that came and went on the screens while the Titans fought for their first stage championship. When Vancouver finally did get the Win the place erupted in cheers. The best way to put it all is with an example. When I got up to use the facilities at during a break I found many other fans had the same idea. Waiting in line I noticed something. Every single person there was wearing a Titans jersey, hat, or jacket. All of them. Maybe it seems obvious that everyone at a watch party for X team would be a fan of X team and own some gear but as someone who goes to a lot of sporting events I can tell you this isn’t the case at every game or even most games. In fact the only other time I have seen this level of devotion was a Seattle Seahawks home game. That is, this watch party for an esports mid-season final match at a bar had the same level of devotion present as a home game for the National Football League. These fans and this devotion was all brought together to watch the Vancouver Titans that Sunday by The Sportsbar LIVE! At Rogers Arena and they made it the best way to watch the match. The Sportsbar LIVE! At Rogers Arena took esports and the Overwatch League seriously. Not as a fad, not as a different thing, but as another sport and that kind of respect and care translated into a wonderful experience for all the fans who turned out for the game. I’m glad I watched this match as it was one of the best in competitive Overwatch history, but I’m grateful that I got to watch it in Vancouver. They didn’t just put on a watch party, they made it a home game.